I've been working with volunteer marketing people to determine why people have a hard time digesting our mapping project, and its importance TO YOU (not just the students). When I talk face to face with people, and am given an opportunity to discuss case studies - students, programs, and volunteers whose lives have been changed through tutoring/mentoring, the audience is always enthused and impressed. Yet when I blog or network online, the message is seemingly lost. So let me take another stab at it, using cleaner and doctored language, courtesy of an alliance between Mapping For Justice and a marketing volunteer (did I mention your individual talents can help students, as much as your time and money?). Students raised in high-poverty, high-crime, and underprivileged neighborhoods typically lack access to non-school resources that aid their development and help put them on a path toward college and career. Tutor/Mentors programs pair volunteer mentors from the professional ranks with capable students who aspire to reach their potential. The problem is that potential volunteers, students, parents, and community leaders/donors who want to support this solution-based approach to poverty and violence likely don’t know where to look to find programs to help in their communities or beyond. 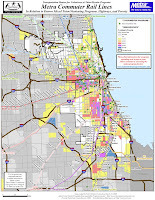 Mapping For Justice maps the locations and prevalence of tutor/mentor programs in relation to factors such as poverty level, “failing” schools, churches, hospitals, banks, drugstores – and other businesses and organizations. Heighten community awareness and involvement, pointing citizens and community leadership to existing tutor/mentor programs. Direct potential volunteers and donors to programs, to ensure program growth and longevity for students. Draw attention to the need for new non-school tutor/mentor programs where none exist, but where poverty is high and students are struggling in poorly-performing schools. Supplement crime news stories with maps to guide concerned citizens to programs who work to solve crime, not just expose it. Help build alliances among businesses, politicians, faith groups, and other leaders who serve communities, by providing maps that help potential partners find each other. Guide tutor/mentor advocates and supporting alliances, through associated blog stories, to strategy documents that provide templates for action. Encourage accountability among community-minded organizations and individuals who seek to contribute to their communities in sustainable ways, by making their student advocacy efforts quicker and easier. Mapping For Justice maintains its infrastructure – including data collection/maintenance, map production, an online presence (map gallery, this blog, and real-time Google-based interactive map), and a marketing effort – all on a $50,000 grant received more than a year ago -- all with a staff of one. This money is gone. Mapping For Justice needs financial help to sustain these innovative tools that bring communities closer together and help develop our workforce. Please help up meet & exceed our goal of raising $5,000 to continue map development. Additionally, If you know of any benefactors looking for a philanthropic tax write off, with an interest in the wars on poverty and crime please guide them our way. We ultimately need a sustainable long-term cash flow to work for more students in the future. Unfortunately, it's come to this. I get the feeling when I talk to people in these hard economic times about the dire financial situation faced by the non profit where I work, people chalk it up to just another charity whining for more hand outs. I wish it wasn't worse than that. 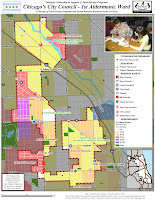 I can't emphasize enough how close our mapping service is to disappearing... and if you've never taken the time to read through what it is we do, and why we are so important to families and students in Chicagoland, please make this the first time you've taken a hard look and read all the way through. We are running a Map-A-Thon. We need just a couple hundred people to donate $25 or thereabouts, to keep our heads above water for the rest of the year. Your $25 will help us continue to fight against crime and poverty… and provide invaluable strategic resources to students, families, volunteers community leadership, and - I believe - you and me. Let me explain quickly why this important mapping effort needs to continue, and why its existance is in jeopardy. 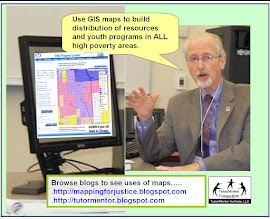 Our maps directly support the growth of new and existing tutor/mentor programs… programs that pair professional volunteers with impoverished students who want to move away from a path that leads to desperation and hopelessness, and "catch up" to those on a path to a bright future that includes college and productive careers. In the end, through tutoring and mentoring, students are equipped with life skills and guidance. But the volunteers grow spiritually and emotionally as well, as they get to know kids they otherwise only hear about via associations with negative news, but find - once they meet - that these students are largely capable and often brilliant. The students often just need additional tutoring and mentoring. The problem though, is that often no one knows these programs exist - volunteers, students, parents, and neighboring leaders who want to work toward solutions to poverty and violence don't know where to look to find programs like these - programs that work on shoestring non-profit budgets with overwhelmed staffs and little to no marketing. 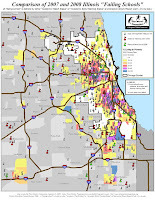 We maintain a directory/database, and map locations of programs, in spatial relation to poverty and failing schools and community/business resources. With one of our maps in hand, potential allies can find each other and work to increase support for new programs where none exist (and our maps show this need, and these locations, clearly). Our maps also show neighboring community leaders where they can direct potential volunteers and much needed dollars, to ensure the growth of programs. Our customers - the programs themselves - have no money to support our efforts! We built and maintain our infrastructure (which includes a map gallery, strategy documents, this blog, and a real-time interactive map on Google technologies) - ALL on a $50,000 grant we received almost two years ago. As we begin to finally get the message out (we were featured on WLUW radio and in the June 2009 issue of Youth Today recently, and President Obama's Barbershop and Webster Wine Bar display our maps to customers at their locations)... as we finally begin to make a difference (several program representatives at a May Conference on Tutoring/Mentoring told us they find supporters through our maps)... the money has run out. The economy is not getting better. There is more violence and frustration than ever. More than ever, our efforts need to continue to help communities come together in tough times to guide kids off streets and onto productive paths. This Map-A-Thon is hoping to raise the money we need to keep the effort going for a few more months. If you have any money to help us maintain our goal, please consider helping us meet our goal of $5000. Just a few dollars will help toward this goal. This is a community effort, and more than ever, we need your help to keep working to help the community come together through maps.